And despite not being my usual environment I have always come away from the holiday having had a damn good time. An important lesson in exploring outside of your comfort zone every now and again. 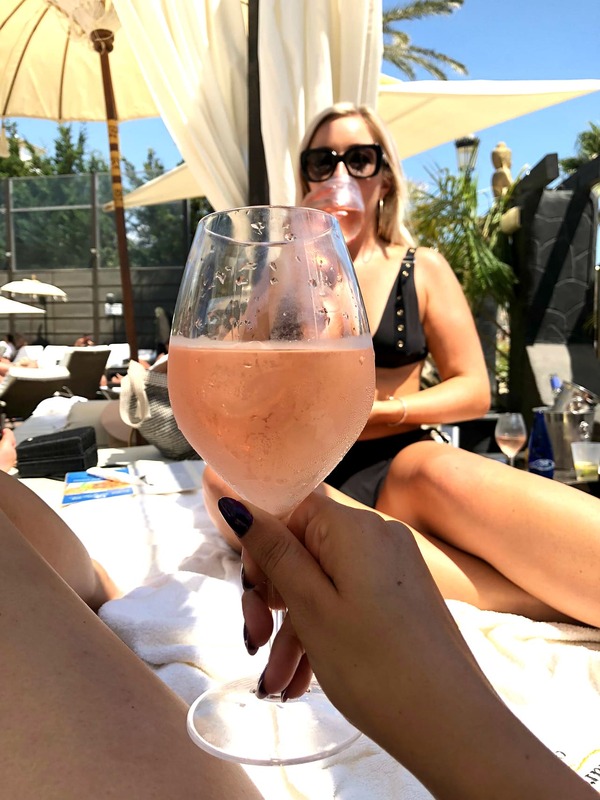 I thought I’d share my experience of Marbella for others who might be considering the trip and like me before my first time going, a little unsure. The photos are very much holiday snaps taken on phones and shared with friends – but I hope you enjoy them regardless! Wait, what?! 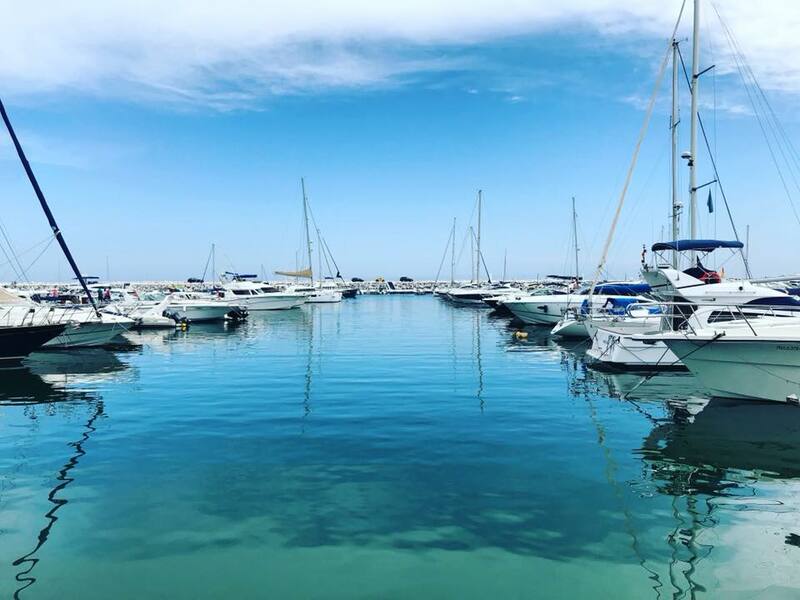 All those holidays to ‘Marbella’ are actually taking place in Puerto Banus, a short drive west of Marbella town. 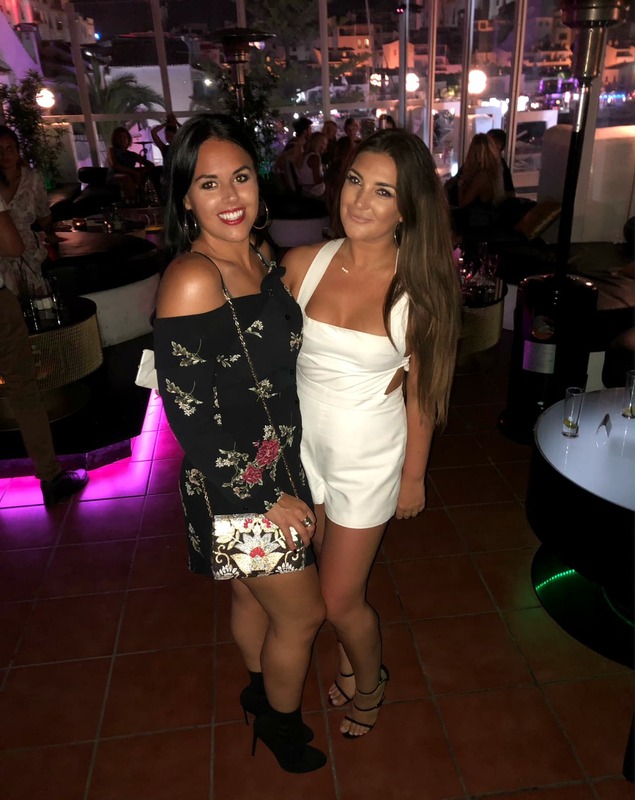 Puerto Banus, and another district called San Pedro are where most party goers will stay, and its where you’ll find all the nightlife. Marbella itself is much more historic and Spanish, whereas the party scene has a heavy injection of Brits. 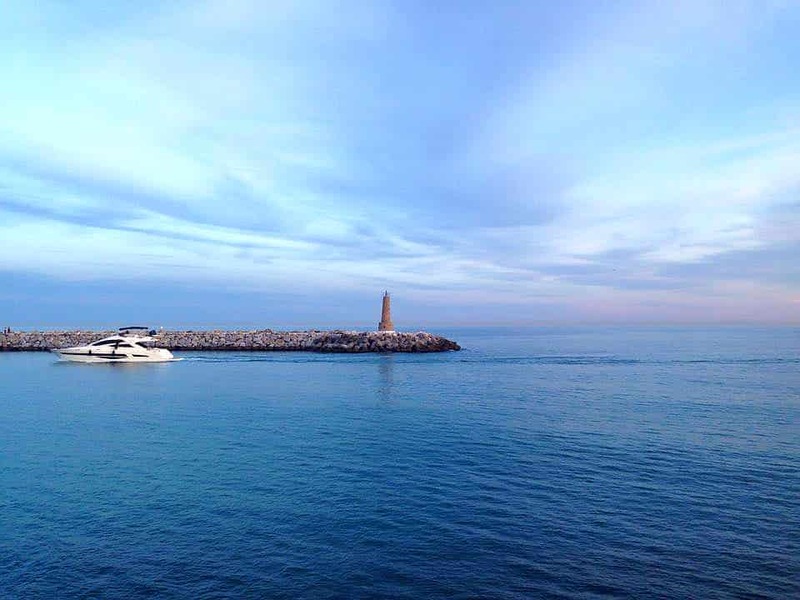 That’s not to say that Puerto Banus, by day, isn’t absolutely charming. It’s not surprising that this is one of my favourite things about visiting! The food is just fantastic; I don’t think i’ve had a bad meal out there. Fish is of course a must to get your fill of. 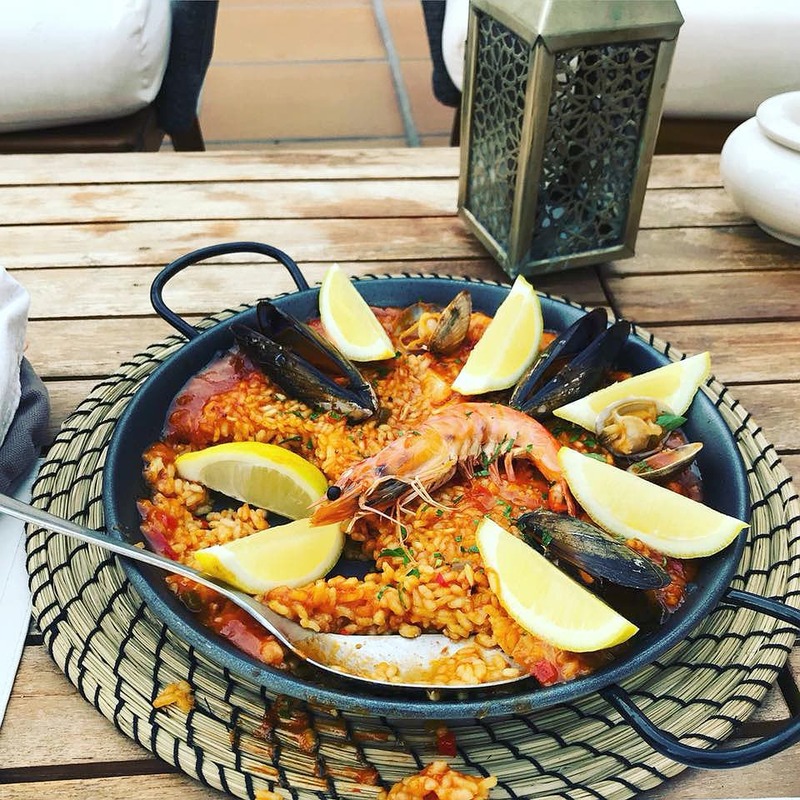 Cooked in paella, smoked, hot, cold, raw… I had fish in all forms! 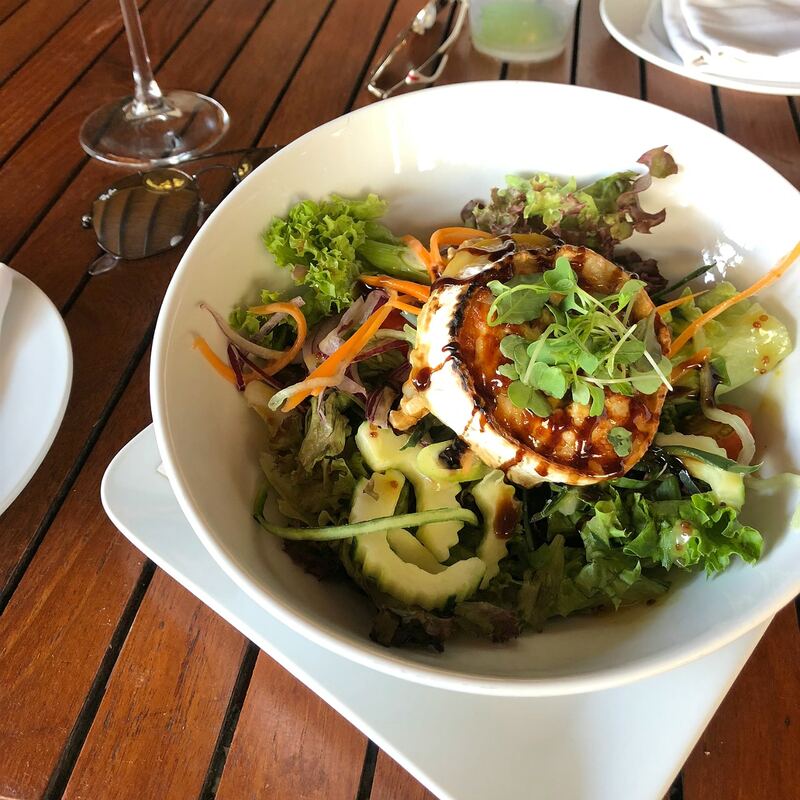 But one of my favourite things to eat in Marbella (sorry – Puerto Banus) is the goats cheese salad at La Sala Beach Club. Like everything out there it’s not cheap at 20 Euros, but it’s just heavenly: grilled goats cheese, apple and walnuts served with a honey an balsamic reduction. Beautiful on a hot day. It’s a much more chilled vibe at this beach club. 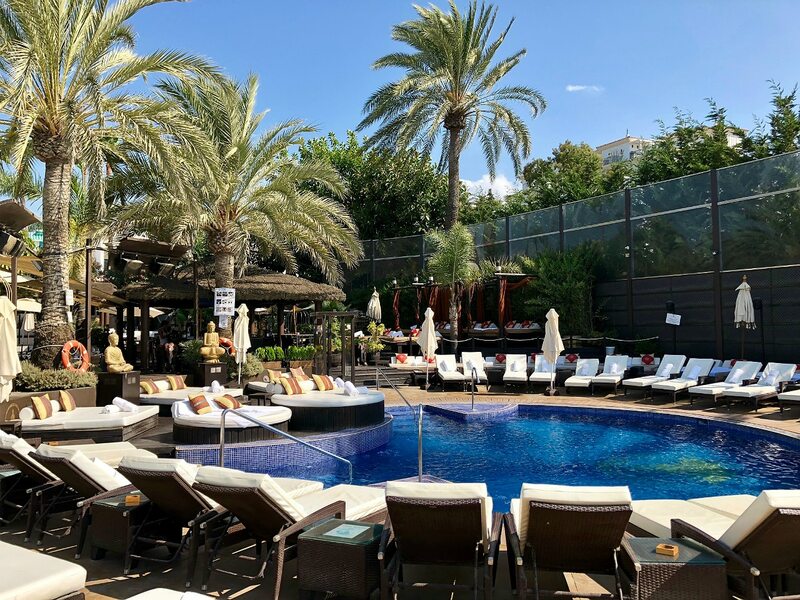 The music still plays and dancers and saxophonists make an appearance, but the atmosphere is much more relaxed and everyone sits around the pool chatting or catching rays on the cabana beds. 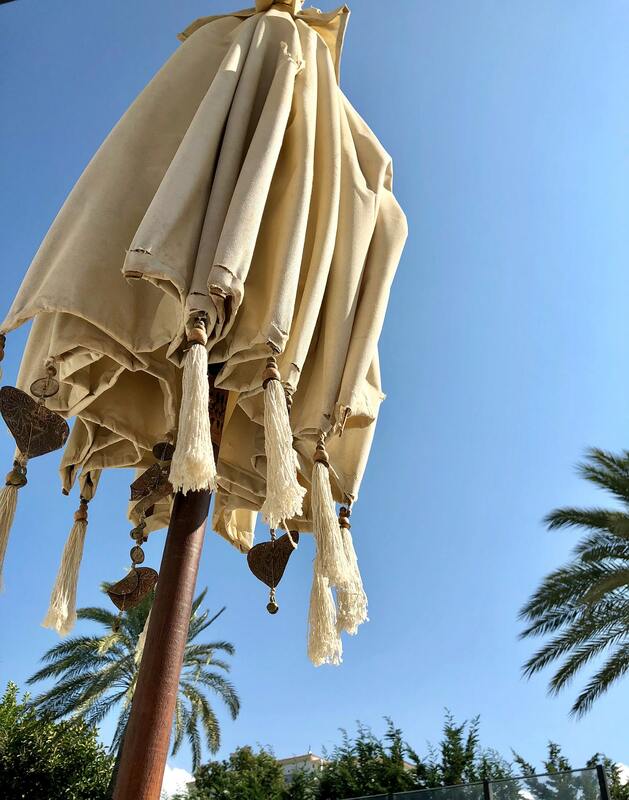 A large Cabana bed for eight people costs 275 Euros or 34 Euros each. Not bad value for an entire day’s use. The beds come with towels, water and lovely bowls of fresh fruit. No. You Don’t Have to Wear Wedges. 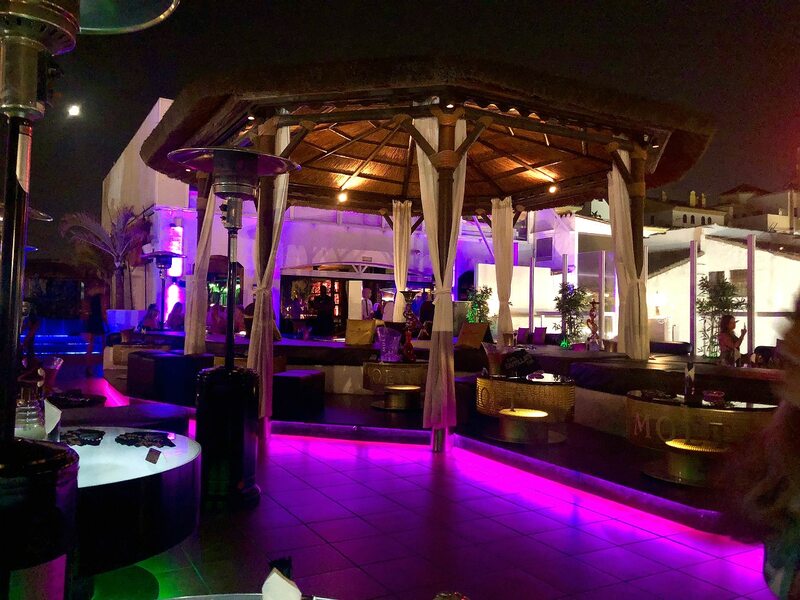 Many take to the unique, all-out glam culture of Marbella like a duck to water. Wedges worn by the poolside, Gucci belts worn over swimwear, perfectly curled hair extensions worn in splash zones. It’s very much form over function. But if like me you find yourself, a creature of comfort in glamorous disguise with a secret wish that every sip of rose wine was in fact a cold pint of cider, then know that there’s definitely fellow secret comfort lovers about as well. Everyone tends to go barefoot within minutes of arriving at a beach club anyway so I’ve never personally understood the heels thing. But heels or flats, wear whatever you want to! Pangea is expensive but in my opinion worth it and it’s my favourite place to go at night. You’ll have your own booth (having dedicated seating is SO appealing to me, especially in my thirties!) with attentive and friendly service. Despite being more upmarket with table service it hasn’t fallen into the trap of becoming pretentious. 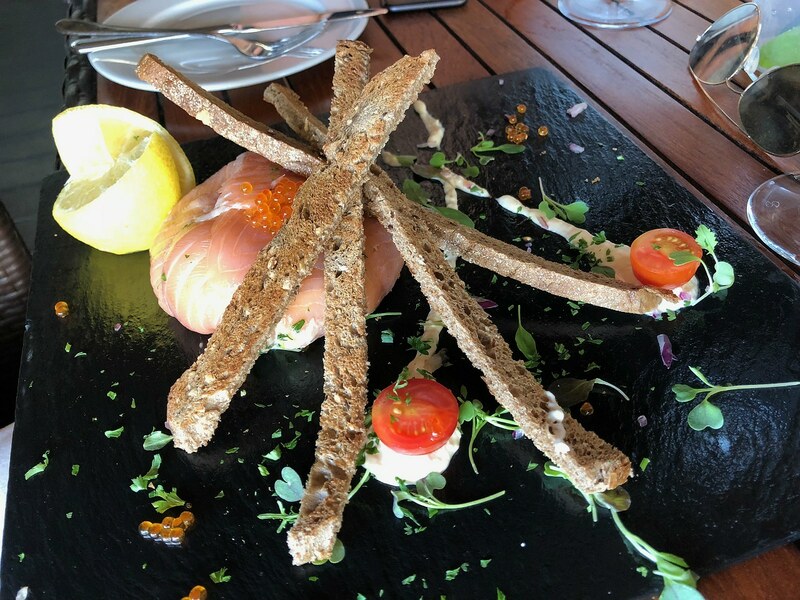 The club is set on a roof terrace with beautiful views onto stone turrets and down onto the marina. 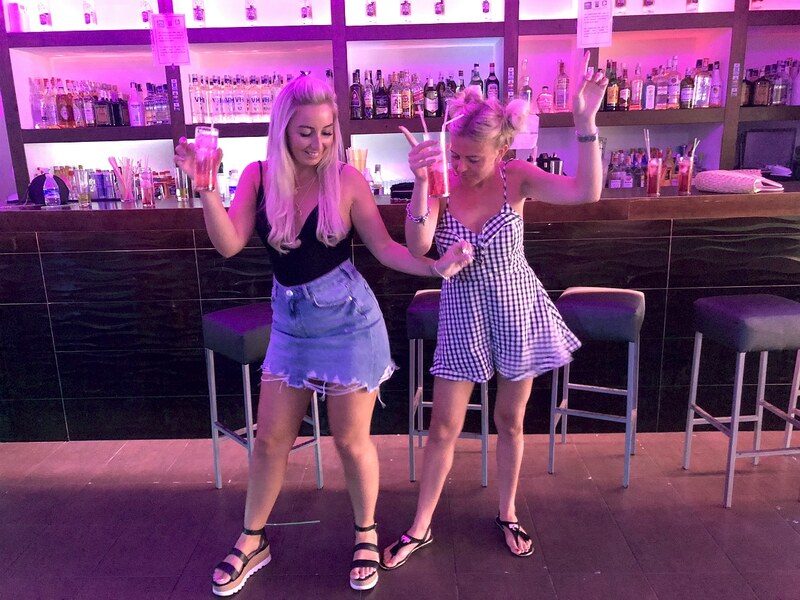 It’s worth noting that bars and clubs only start to get really lively from Midnight onwards, so be prepared to roll back your getting ready time a good few hours… and your bedtime! 5:30am Espresso Martinis at the airport before your flight are great in theory… and nothing but heartburn in reality. News Cafe bar promoters will approach you at the Marina and offer you a free bottle of vodka to come to the bar. There’s no real catch so feel free to take them up on it, just know that the bottle has been watered down. Pour yourself a big measure, drink up with a Fanta Lemon and move on. As I’ve said it’s overall a very safe place to party. The only time to be a little more alert is in the small hours around the food outlets in the marina. It gets very busy and is a concentration of drunk people ending their night. You must try the Japanese toilets at Astral Bar! I’ve never giggled so much after a jug of sangria and discovering the ‘spray’ option. Check the price before you say yes to a shisha up-sell by the bar staff. It’s easy to just say yes when you’re in the moment, but they can be as much as 80 euros. Because the less time spent in front of the mirror means more time having fun. Nailene So Natural nails. Better than any other DIY nails I’ve used; rather than lasting a few days before pinging off they last weeks! Look just as good as the salon but they only cost £7.00. That means more money for cocktails. Iconic Original Illuminator. Rub onto your shoulders and legs for instant holiday glow. Maxfactor Lipfinity: Any lip paint is great for daytime events because you don’t have to worry about reapplying. I really like Lipfinity because the colours are enough to enhance your lips whilst still looking quite natural. Wunderbrow 2: I love how this product stays put even with water and on hot nights. You can also build up the pigment to suit your style. Having your brows done instantly transforms your face!